Mold is one of the silent problems that may suddenly emerge inside your home and property. Mold is the collective term used for fungi found indoors and outdoors which appear as dark- or light-colored patches on walls, ceilings, and floors, among others, and is usually accompanied by a damp, musty odor. Mold growth can be encouraged by a variety of factors. 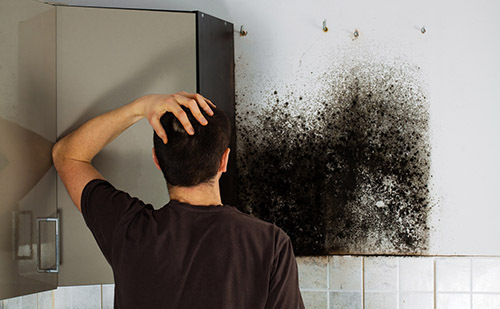 Mold thrives in dark places and areas where there is moisture, which may be caused by leaks and cracks in the plumbing or water seepage from an outside source. High levels of humidity, as well as water condensation, also have significant contributions to the growth of mold. Heavy rains will lead to Mold in your home. If not attended to immediately, mold can spread throughout your whole house or building, which means potential threats to your health. Mold spores can contaminate the air and affect indoor air quality, thereby causing nasal allergies or worse, respiratory and cardiovascular illnesses. In addition, it can also discolor your drywall and painted areas, which isn’t visually appealing. Heavy rains will accelerate mold growth and water damage. In order to prevent mold growth, it is important to take notice of small leaks that may have developed in your pipes. It takes immediate action to address a mold problem before it gets serious. Standing water due to hurricanes have to be treated immediately. Tackle the issue early on to save money, time, and effort. While this is so, dealing with the damage on your own might just worsen the problem. There are professional mold inspection and remediation companies out there who have the proper training, experience, and equipment to exterminate mold from your home and give you tips to help prevent it from growing again.